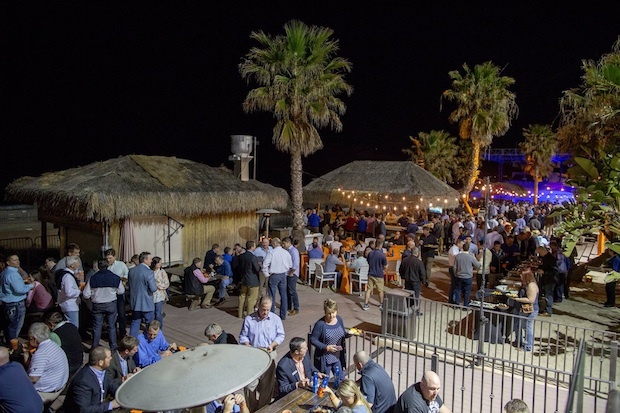 Over 80 Ransomes Jacobsen guests and staff from Europe, the Asia-Pacific territory and South America attended the Golf Industry Show in San Diego recently. Following long flights from all parts of the globe, the first full day in California featured a golf competition at Rancho Bernardo Inn Golf Resort, where 23 teams from across the Ransomes Jacobsen territory competed in a Texas Scramble. Once again the winners came from Scandinavia as the Swedish group of Ivan Vasilev, Mattias Jockert, Andreas Jonsson and Steven Balfour won the fun event. After returning to the hotel, the majority of the group assembled at the fourth floor Pool Bar to watch the Super Bowl. The next day, it was a return visit to Rancho Bernardo for a Product Demonstration event, bolstered by additional guests from Spain and Russia. 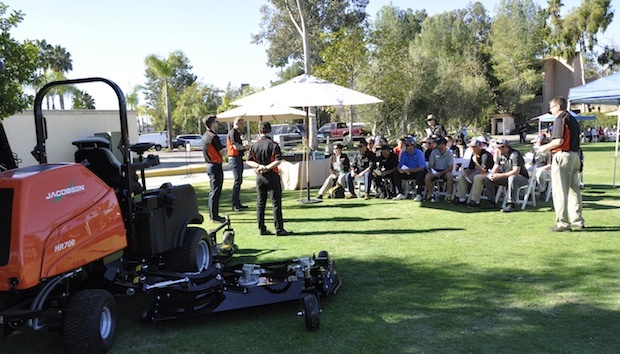 For this, the 105 guests were split into four groups and rotated between stations that featured the Jacobsen Spraytek, the new Jacobsen HR700 batwing rotary, the Jacobsen Truckster – with an opportunity to test it against the competition, and finally a tour of the Rancho Bernardo maintenance facility. Day three involved another early start as the group boarded coaches and were transported to the Coronado Municipal Golf Course for a combined Smithco/Turfco demonstration event. Following breakfast in the clubhouse, both companies gave presentations on their new products and presented various staff and dealer awards. This was followed by product demonstrations on the club’s driving range. During the afternoon two Ransomes Jacobsen guests, Darren Baldwin, Head of Playing Surfaces and Estates at Tottenham Hotspur Football Club and Chris Haspell, Course Manager at Castle Stuart Golf Links, provided fascinating back-to-back presentations on the construction and maintenance of their diverse workplaces. In the evening, the group plus other invited guests headed over to the Wavehouse Beach Club in Mission Beach for the Jacobsen Hospitality event, where over 900 people were kept entertained by professional surfers in a man-made surf pool which created a variety of giant waves for them to demonstrate their board skills. 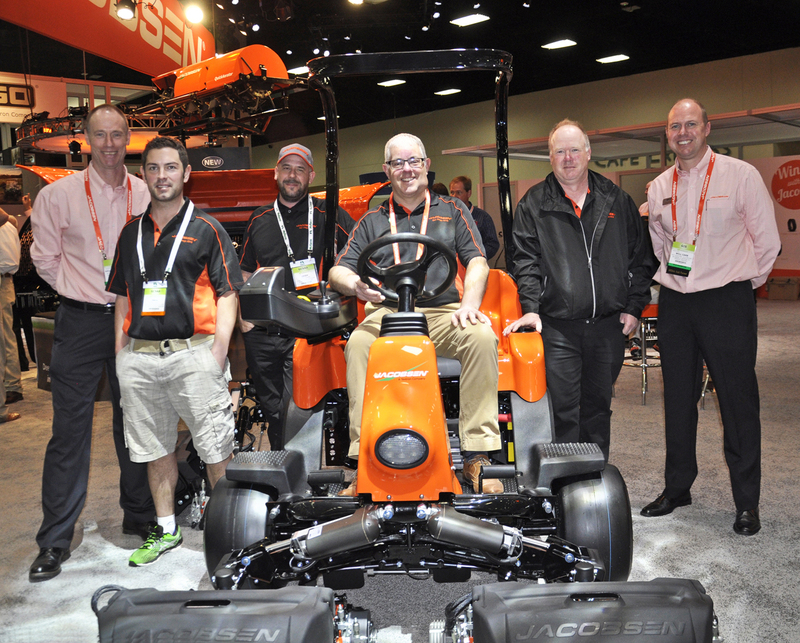 Day four was Show Day, with the Jacobsen booth at the impressive San Diego Convention Centre a major attraction for the guests. The impressive display of Jacobsen equipment included the new range of Jacobsen aerators, signifying the company’s return to this sector with three all-new tractor mounted machines. Also on display was the new Jacobsen HR700 wide area rotary including the introduction of the world’s first 14 foot derivative, providing the highest productivity from this class of mower. The final day allowed the group a further visit to the show or the opportunity to relax or go shopping for souvenirs, before boarding the coaches late afternoon for San Diego airport and the long flight home. “What a brilliant experience from start to finish. I didn’t really know what to expect as this was my first time as a guest of Ransomes Jacobsen to the Golf Industry Show. However, we were looked after so well from start to finish and the hospitality was out of this world. The Jacobsen stand was very impressive and the overall show is huge, with so much to see. 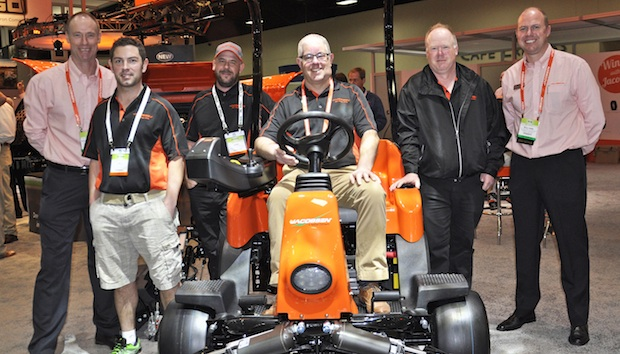 “I would like to thank the Ransomes Jacobsen team for inviting me to the GIS in San Diego. It was one of the most exhausting and fun trips I have ever been on; extremely valuable and the networks of people that you and the company have given to me and the African Turf Academy project is immeasurable in its value.